We make election results easy to investigate. In many counties in certain states, there are vastly more votes for the Republican candidate in precincts where more people voted. In these same states there are few or no counties where there are more votes for the Democratic candidate in precincts where more people voted. We find this extremely perplexing. Our analysis looks at the relationship between the number of votes cast at each polling place in a given county and the percentage of votes cast for a given candidate at that polling place. There is usually no clear demographic reason for larger precincts in urban and suburban areas to be strongly associated with any political preference. 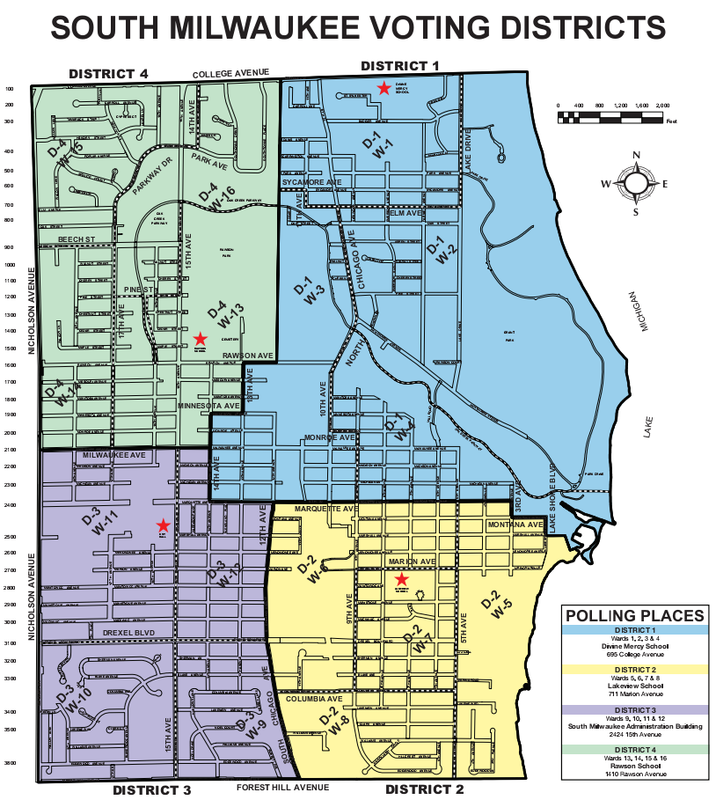 The term “precinct” refers to the geographical region that is assigned to an individual polling place. Unlike congressional districts, the size and political leaning of voting precincts is simply a function of the density and demographics of the surrounding population. The political leaning of a given voting precinct should not be strongly related to its size, except for the observation that very small precincts tend to be located in rural areas, which historically have voted more conservatively. In general, as the vote count is tallied for a given county starting with the smallest precincts and moving to the larger ones, we would expect the percent of votes for a given candidate to quickly stabilize at or near the final outcome, unless for some reason there is a strong bias toward one candidate in larger precincts. A more thorough explanation of the reason for this is here. We see these patterns of increasing Republican votes with increasing precinct size most strongly at the county level. When all the counties in a state are aggregated together, these strong patterns often cancel each other out, resulting in smoother or flatter lines. Because of this our analysis examines election results county by county. We adopted a very simple metric – deltaM* – to describe how “flat” one of these sets of lines is. This estimates numerically the extent to which there is a change in vote margin as we move from adding only smaller precincts to adding larger precincts to the totals. We arrive at this margin by first identifying the median precinct size – where half the precincts are smaller and half the precincts are larger. We then add up the votes for the two candidates in all of the precincts below and including the median to see how different the vote outcome would be if we stopped counting votes after we added only the results from the smaller precincts. If the outcome for all precincts compared to that for only the smaller half of the precincts favors the Republican candidate, deltaM is positive. If the final outcome compared to the “smaller precincts only” outcome favors the Democratic candidate, deltaM is negative. DeltaM represents the distance between the vote lines at the far right of the graph compared to the distance between the lines at the middle of the graph. Notice that at the far left of the graph there is a bit of “noise”, but that the line quickly goes flat as you move toward the right. 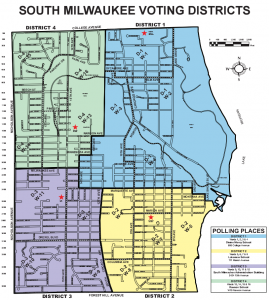 This means that precincts of all sizes are scattered fairly evenly about this large and diverse county. This is what one would generally expect to see for most large counties. In the graph above, deltaM is zero. There is no difference in election outcome if you count only the smaller precincts. In Milwaukee County, WI, the percent of Republican votes rose from below 20% for precincts at or below the median size, to over 30% for all precincts at the far right of the graph, a change of 10%. The percent of Democratic votes fell a corresponding 10% from the median to the far right of the graph, making our deltaM (change in margin) 20.2%. Notice that the average percent of Republican votes for precincts with fewer than 953 voters is just over 20%, while for precincts with fewer than 1151 voters the average percent is nearly 25%. Why would so many more Republicans cast their votes at precincts at the larger end of that very narrow range? Also notice that the red line starts its upward slope far to the left of the center of the graph. In fact the line begins to climb upward when the Republican percent of the vote is around 15%. This indicates that our deltaM calculation is conservative. As many as 30% of the votes in this county were affected by this rising line. To estimate the number of votes affected by a non-zero deltaM we multiply deltaM by the total number of ballots cast in the county. You can see the number of votes cast above the deltaM number in the top left corner of the graphs. 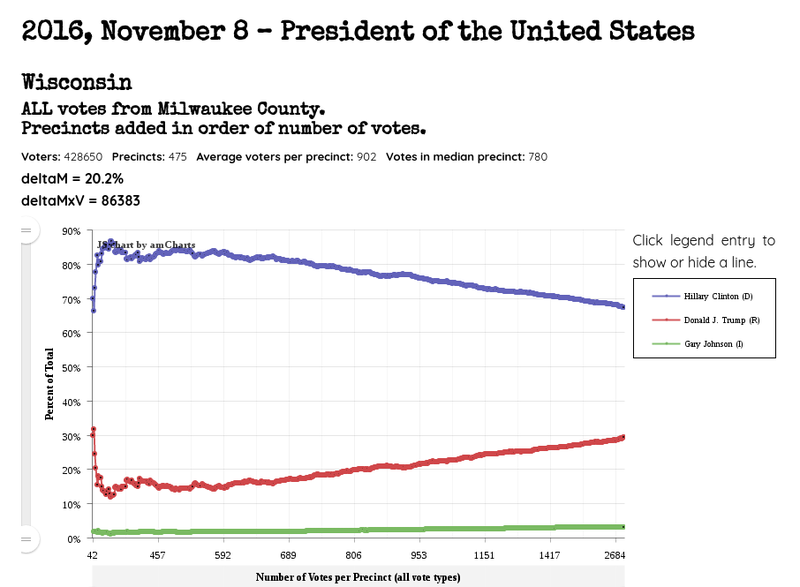 In the case of Milwaukee county when we multiply the 20.2% deltaM margin by the 428650 votes cast, we conservatively estimate 85,000 votes were cast that differ from what would be expected had the patterns of votes cast in larger precincts been consistent with the patterns in smaller precincts. We will refer to this number as “deltaMxV”. 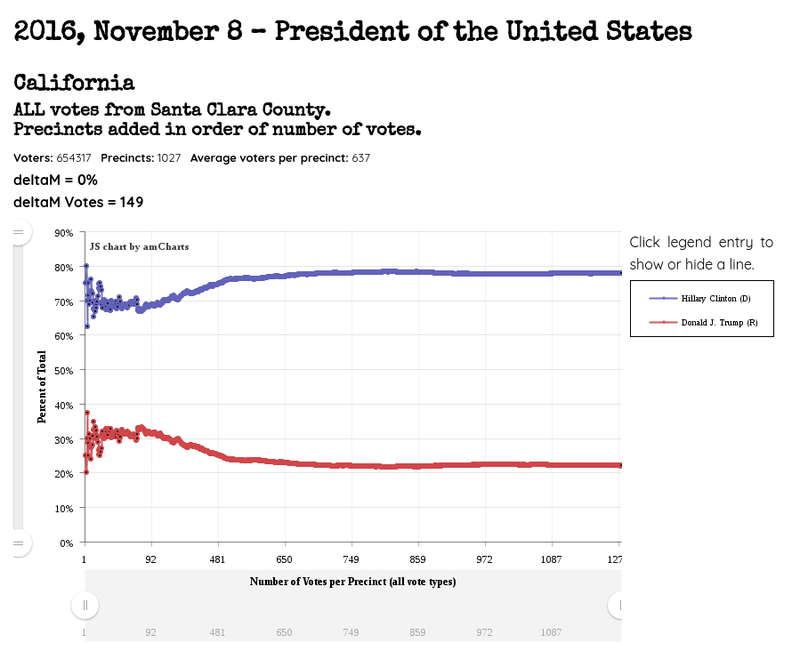 In other words, if the lines had become flat at the center of the graph, as the Law of Large Numbers predicts they should, the Republican candidate would have had a margin of at least 85,000 votes(deltaMxV) less than the reported results indicated, in this county alone. If you look at just one county it is difficult to definitively prove that a “red shift” is not simply due to some kind of odd demographic distribution with respect to precinct size. This would mean that where there is a notable red shift, as in Milwaukee County WI, most of the larger precincts are found in heavily Republican areas. This seems unlikely, but is not necessarily impossible. For this reason, we look at all the large counties in a state to get a clearer sense of whether a red shift like the one we see above is simply a statistical fluke of some sort. Thus for each race in each state we calculate the deltaM for each county that has more than 50 precincts/polling places. We then multiply the deltaM by the number of votes cast in each county to estimate the votes associated with the lines’ deviations from horizontal to get deltaMxV*. In order to identify the proportion of votes at the state level that are associated with this phenomenon, we then sum all of the deltaMxV’s for all eligible counties in the states. We will call this statewide sum “deltaMxV_S.” A positive deltaMxV_S represents a statewide increases in Republican votes and a negative deltaMxV_S represents a statewide decrease in Republican votes. We can then divide deltaMxV_S by the total number of votes cast in the state to see what proportion (deltaM_S) of the state’s total votes have been affected by this phenomenon. In the tabs for each state under the “Elections by State” tab you will see a table displaying the deltaM for each of its counties – simply click the plus sign to display the table. The colors indicate whether that county voted Republican or Democrat, and the intensity of the colors indicate how strongly the vote favored the winning candidate. If the shifts were simply statistical flukes, one would expect “red shifts” to be canceled by corresponding “blue shifts” in other counties in the state. This would cause the overall deltaM for the state to stabilize near zero for each race. Indeed we do see a near zero deltaM in a few states, but not in our swing states. The table below shows the overall deltaM_S and deltaMxV_S values for the races within states we have analyzed so far. Of the eight 2016 Presidential races we have analyzed, there are five strongly positive statewide deltaM_S values (favoring Republicans). All five of these are in “swing states”. Click any column header to sort the table below. Our deltaM and deltaMxV metrics were developed with much guidance and feedback from Dr. Laura Little and Dr. Tracy Simpson of the University of Washington.